IT executives and decision makers are under constant pressure to deliver simultaneously near-term cost savings while also modernizing IT architectures and systems to allow the business to respond more rapidly to, and to take advantage of, changing market conditions. In the past, some IT executives were given a budget and the latitude to pursue “green field” development of entirely new IT solutions to replace existing systems with a goal of providing, at a minimum, a solution that is more flexible and amenable to future changes. However, today’s global economic conditions have significantly curtailed this approach to modernization. IT executives are challenged to show a return on investment significantly sooner which is causing many companies to take a more incremental, evolutionary approach to modernizing their systems. Certainly new IT architectures, systems, and solutions continue to be developed, but their focus has shifted away from replacing existing solutions to implementing solutions to new problems and providing new capabilities to the business. A common architecture that is used for these incremental modernization efforts is one based on service orientation and the adoption of industry-standard frameworks. This architecture allows IT executives to extract the most value from existing assets by prescribing standardized ways to achieve application and system interoperability in a non-proprietary manner. IT executives can then build out new capabilities that either augment, or make use of, existing solutions faster and with greater flexibility and choice. 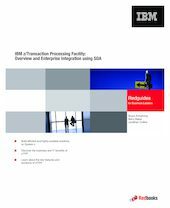 IBM® Transaction Processing Facility (TPF), with its latest version being IBM z/Transaction Processing Facility (z/TPF) Enterprise Edition v1.1, has a lineage that dates back to the 1960s. It is used by many Fortune 500 and multiple Fortune 100 companies, typically providing the infrastructure that enables one of their main sources of revenue. Said another way, the underlying TPF architecture, which remains unchanged with z/TPF, combined with TPF-based applications, provides a proven solution to some of the most demanding transaction-based workloads—workloads that require a globally consistent view of the business’s critical data that is undergoing near-constant change, while also providing extremely high levels of availability. Beyond this core capability, z/TPF also provides for a modern, open run time that allows it to be an active participant in the larger enterprise architecture. z/TPF relies on an open Linux® and Eclipse-based development environment that expands the z/TPF talent pool. This IBM Redguide™ publication describes the business drivers and their impact on IT. This guide also discusses how z/TPF, in conjunction with the System z® hardware platform, can play a significant role in an enterprise’s overall IT architecture by providing flexibility, responsiveness to market and customer needs, and cost effectiveness. It also discusses the features and capabilities in z/TPF that provide for greater application insight, allowing z/TPF-based assets to be modernized through service orientation and the adoption of industry-standard application frameworks.